Remote Utilities is a free remote access program for Windows. You can connect to as many as 10 computers for free from a mobile device or desktop program. There are 15 different tools for connecting to a remote computer with Remote Utilities, which makes it one of the better remote desktop applications. Keep reading to find some pros and cons on Remote Utilities, how it works, and what I think about the software. 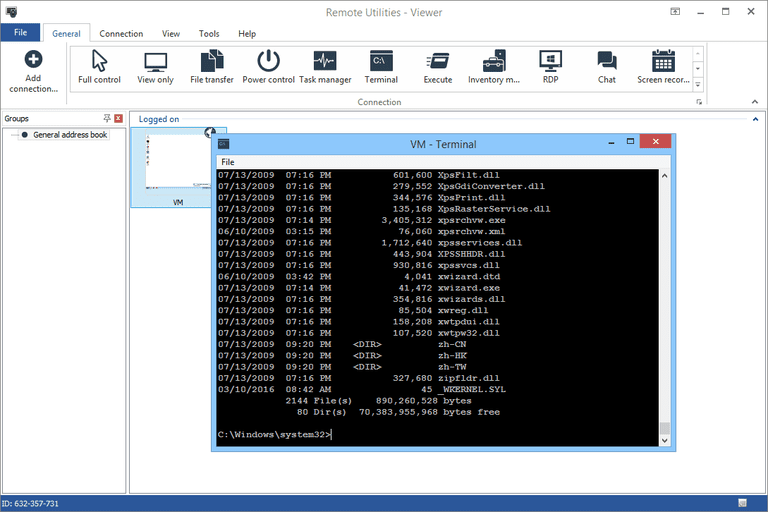 This review is of Remote Utilities version 6.10.8.0, released on April 14, 2019. Please let me know if there's a newer version I need to review. Remote Utilities communicates by creating a pair between a host and client PC. The host computer installs the Host software and the client installs the Viewer program. The "Host" here means the computer that should be remoted into, while the "Viewer" is the one that's doing the remoting in—the computer that needs to control the other one. There are two versions of the host software: A regular installer version that actually places the program on the computer, called "Host" on the download page, and the program that runs without installation that makes it really easy to quickly connect to the host computer, called "Agent" on the download page. When the Host software is launched, the first thing you're told to do is set a password. This is an important step to secure your computer from unauthorized access. This password will be used by the Viewer program to access the host computer. The host computer then needs to open the settings for the Host program and access the Internet-ID connection setting option to generate a 9-digit code that the Viewer software can use to access the host. Now the client PC that has the Viewer program installed can create a new connection using the Internet ID and password that was configured on the host computer. The Viewer program, like the Host software, can also be downloaded and ran as a portable program. At this point, when the connection has been established, the client can begin launching remote tools against the host computer. To sum things up, if you're looking for the quickest and easiest way to connect to a computer using Remote Utilities, download and install the "Agent" program on the computer that you'll be connecting to and then download and run "Portable Viewer" to connect to it. There are some really great tools included with Remote Utilities that, in my opinion, pushes it over the edge when comparing it to similar remote desktop software. The host software is a little confusing when you try to set up security options, but once you've got it all figured out and the Viewer software can make the connection, the tools are really great. You can choose to view the remote screen in view only mode or full control, which is helpful if you're providing remote support but are just wanting to watch what the user is doing and not interfere yet. It's then just a few clicks away to change the mode while you're in the remote session. I like the file transfer feature in Remote Utilities because it doesn't prompt the host user for a confirmation. You can open the file transfer tool from the Viewer, transfer files to and from the computer, and never even see the remote screen. This surely speeds things up when you're just wanting to access the remote files and not the screen as well. There's also a remote Command Prompt that looks just like a regular one but runs commands against the host computer and not the client, which is a really neat feature to try out. I also like the Inventory manager, which shows amazing detail about the host operating system, hardware, and installed software, complete with version numbers and manufacturer names. When trying out the mobile Viewer application, I was able to connect without any issues and view multiple monitors at once with great clarity, which was excellent. As you're installing the program, choose the Free license option during setup to avoid the 30-day trial.